Action Alerts allow you to send messages to elected officials and decision-makers on important votes. Click on the links below to take action on current issues. Have you heard about the ocean planning process happening in New York, New Jersey, Delaware, Maryland, and Virginia? The draft ocean plan is out, and there are some real opportunities in the plan to protect both the environment and surfing. But the RPB is facing pressure from oil developers and fishermen to weaken the plan–let’s show them that there are tons of people in the region that care about our oceans and beaches! Ocean planning is a rare opportunity for ocean lovers to lock in protections for both recreation and the environment into the future. But the governing body who is creating the ocean plan needs some encouragement to stand up to developers. Please take one minute and send them a strong message to keep our oceans healthy! Our federal government recently announced plans to protect the Atlantic coast from offshore oil drilling in the next five year leasing plan. The Proposed Program for 2017 – 2022 excludes any lease sales in the Mid- and South Atlantic, responding to overwhelming public opposition to this dirty and dangerous practice. Surfrider applauds this announcement and encourages our members to express support for the decison – as well as opposition to drilling in the Arctic – through the public comment period (more info below). The battle to protect the Atlantic is far from over, however. The federal government still plans to allow seismic testing for oil and gas in the Atlantic in anticipation of drilling in the 2023 – 2027 leasing plan. We already know that seismic testing represents the first step towards oil and gas development, which is fraught with troubling environmental consequences. However, seismic testing itself is a major threat to marine wildlife and our ocean ecosystems. The planned surveys will utilize high-decibel sound blasts – underwater explosions – that will saturate the marine environment with noise pollution. Vessels towing airguns will traverse large swaths of ocean, releasing acoustic blasts every ten seconds for weeks or months on end. This seismic exploration will occur over thousands of square miles and cause devastating impacts to marine wildlife and the health of the ecosystem. According to the Department of Interior’s own estimates, seismic exploration in the Atlantic could injure up to 130,000 marine mammals over the next eight years, including the critically endangered Right Whale and the bottlenose dolphin. The noise from surveys will also disrupt millions of other mammals and sea turtles by interfering with mating, communication, and migration activities. Finally, seismic surveys will displace and cause impacts – such as temporary hearing loss – to a broad range of fish and invertebrate populations. Yet, the negative effects of seismic exploration will not be limited to just the ecological realm. Communities on the Atlantic coast depend on a healthy ocean to support industries such as recreation, tourism, and commercial fishing. The degradation to the marine ecosystem caused by seismic exploration will put these industries – and the billions of dollars they contribute to the region’s economy – at risk. I am writing to urge BOEM to protect and exclude from the Proposed Program regions of the United States that have not been exposed to offshore oil and gas development. I wholly support protecting the Atlantic from offshore drilling and these protections should extend to any new areas of Alaska as well. Offshore drilling significantly damages both the environment and related economies, while exposing our coastlines to the risk of catastrophic oil spills. Moreover, I disagree with BOEM’s conclusion that lease sales can commence in the Atlantic subsequent to the year 2022 after conflicting uses in the Atlantic are “deconflicted.” Our environment, economies, health, and well-being cannot be resolved with the dirty practice of offshore drilling. Further, I object to further plans for seismic testing in the Atlantic, which is the first step toward offshore drilling. 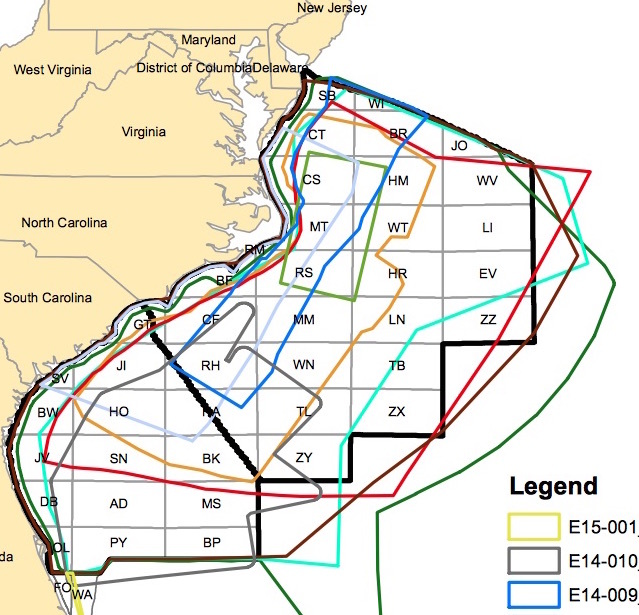 Seismic testing is an environmentally devastating practice and should not go forward in the Atlantic given the overwhelming opposition against both seismic testing and offshore drilling in the region. Instead of focusing on oil and gas projects, BOEM should actively pursue the development of renewable energy infrastructure and power generation, utilizing subsidies, credits and/or other market mechanisms.